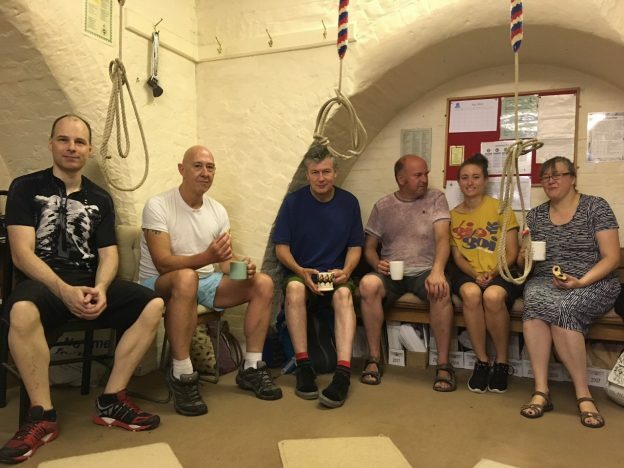 The bells at Bermondsey were rung for a live recording for BBC Radio 4’s Today Programme on 25 July 2018. Dr Virginia Compton from the Big Ideas company, who are coordinating the campaign, gave an account of the campaign so far. She announced that the 1000th person had registered on the Ringing Remembers site. She gave a very articulate account of what ringing is all about. Our ringers discharged their responsibilities admirably. It was more nerve wracking than ringing in a striking competition, knowing that this was a nation-wide broadcast with probably many ringers listening. The band comprised of 3 recent recruits, 2 of whom signed up this year through Ringing Remembers. Here we are sipping tea and munching pain au chocolat for breakfast before we rang. This entry was posted in News, Training on 26 July 2018 by Mary-Louise.